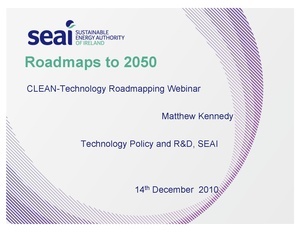 The webinar will focus on an approach for developing and implementing roadmaps based on the IEA’s How-to-Guide for Roadmaps and will examine lessons-learned from Ireland’s use of the IEA Guide. Following the presentations, a discussion and Q&A session will be held. We hope that participants will be able to provide feedback on roadmapping and related low emissions planning needs in developing countries during this discussion. This webinar is the second installment in a series of CLEAN webinars that will be provided on low emissions planning topics. The recorded webinar archive and information on future webinars is posted online at www.OpenEI/CLEAN. 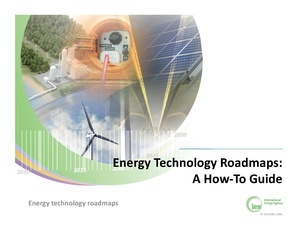 If you are interested in attending the webinar or participating in future webinars as either a participant or speaker please contact Samuel Tobin at samuel.tobin@nrel.gov. ↑ "Technology Roadmapping: Lessons, Experiences and Tools Webinar"